I liken my life to a crazy quilt. You never know what size or color the next block will be, what print or fabric it will be made from or which stitch, ribbon or charm it will be adorned with. 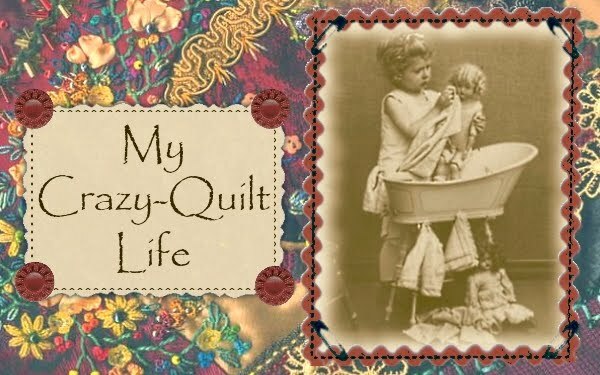 Welcome to my crazy-quilt life. Hopefully my blog is a reflection of that & me! Sometimes I come here just to put my thoughts somewhere. I don't always publish them for the world to see, but it's good to get them out of my head and into black and white, a reference point to go back to. I hope your Hitty undies come today. “Crazy quilts” were so named because of the strong colors and busy, confusing nature of their designs. Enough said! In searching for a crazy quilt design for my blog, I ran across Sharon from Australia. Her work is amazing and she kindly allowed me to use a picture. Check it out! Need a blog banner or design? I always check out etsy first! I've found some amazing, creative people on there! Laura designed my banner for me. Check her out! Kindly ask for use of anything you see on this blog. All rights reserved.. Simple theme. Theme images by gaffera. Powered by Blogger.